Graduated with BVSc (Hons I) from the University of Sydney in 2003. Worked for 12 years in various animal shelters (RSPCA NSW and Animal Welfare League NSW). Was on the board of Sydney Dogs and Cats Home for 2 years. 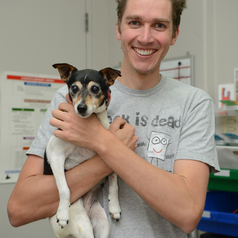 Helped establish Pets in the Park in 2012, a charity dedicated to helping the homeless care for their pets, which now runs clinics in NSW, Victoria, Queensland, ACT and Tasmania. Returned to the University of Sydney in 2012 and graduated with a PhD in 2016. The title of my thesis was 'Epidemiology and diagnosis of feline retroviruses (FIV and FeLV) in Australia and a trial of FIV vaccine effectiveness in the field.' Was a recipient of an Endeavour Research Fellowship in 2017 and conducted further research into FIV and FeLV at the University of Glasgow in collaboration with researchers from the University of Sydney. In 2018 returned to the University of Sydney as Associate Lecturer in Veterinary Microbiology and Animal Disease.